Kaav, Kerala’s own three-piece instrumental band, makes me truly excited to be a music listener in India today. In an industry where Indian-influenced rock has little real identity, Syam Pai (guitars) Shabeer Ali (bass) and Arun Kumar (drums) manage to stand out. It’s not difficult to imagine the group lying around on Vypin island on a stormy Sunday afternoon, making musical magic against the background of Kerala’s heavenly atmosphere. 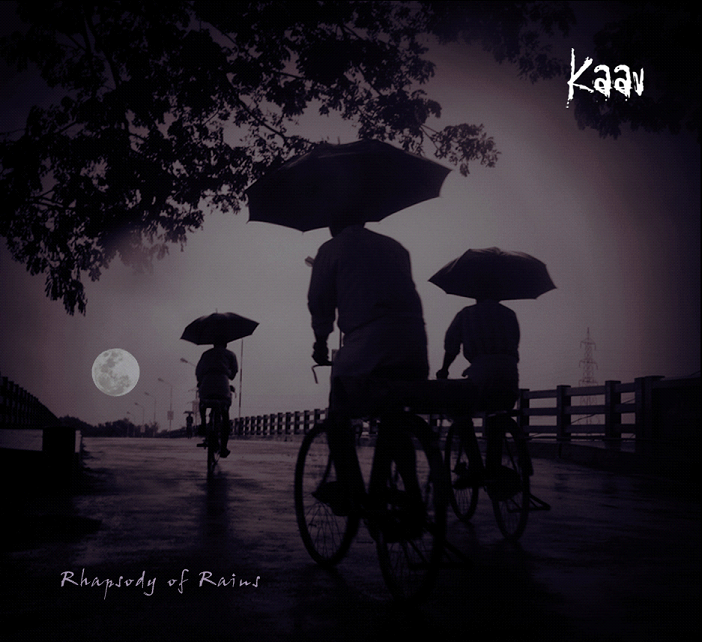 To witness this magic, look no further than “Thee,” a single from Kaav’s latest aptly named album Raphsody of Rains (produced with the help of Indian legend Baiju Dharmajan and Cochym Records). “Thee,” means fire in Malayalam, and according to Kaav “represents the inner fire or the inner strength of humans that gets unleashed in different ways.” The song captures the essence of this strength perfectly, and constantly has throwbacks to the images brought up by the album’s title itself. It’s impossible to listen to the initial bars of the song without thinking of the first few smatterings of raindrops on a cloudy, thunder-filled day. The track starts up with a mood-setting clean guitar strum, accompanied by a low, warm, ringing bassnote and syncopated six-beat hat rhythm; slowly, the mood shifts as the music develops into a harder sound. Softly distorted guitars show up, with gorgeously melodic guitar and bass riffs. The song gradually builds up, but chooses to delay its breaking point – instead, we segue into a beautiful spoken-word excerpt from legendary film maker John Abraham’s “Amma Ariyan.” The critical point happens only after this, and remains wonderfully understated. The song is then gradually brought back down to earth by a lone, squealing, wavering electric guitar note. The song’s music video is a piece of art in its own right. Excerpts of Abraham’s film are interspersed in black-and-white with muted-colour clips of the band performing, in an artsy move that never crosses the line into pretentiousness. Verdict: Kaav represent everything that the Indian music scene has to be hopeful about. Their music retains every inch of their Malayalli heritage, incorporates enough western influence to be accessible to a wider audience, and has a universality to it that cements it as a work of art.